What is an intentional giver? It's Sunday morning and you're sitting in church. It's that time in the service when the ushers stand and get ready to pass the offering plates. You reach for your wallet in your back pocket or your purse to see if you have any cash. Oh, good. You find a $10 bill that you can toss into the plate. So the plate comes down your row, and you put in your $10. You feel good, right? At least you gave something back to God and your church. Unfortunately, millions of weekly church goers perform this style of giving - they like to "shoot from the hip." Their giving most likely reflects their overall money plan - they don't have much of one. The word intentional is defined as done with intention or on purpose. If I'm doing something with intention, then I am taking action after a mental determination upon some result. Let's use weight loss as an example. When people have an extra 10 or 20 pounds that they would like to shed, what do they do? They come up with a weight loss plan. First, they alter their diet. They come up with lower-calorie meal choices and a weekly menu. They go to the grocery store to purchase the ingredients they need, and they begin to eat healthier. Second, they begin to exercise. They schedule time in their day to get in a workout. If these people take action and are consistent with their plan, they will begin to lose weight. On the first day of the week, each one of you should set aside a sum of money in keeping with his income, saving it up, so that when I come no collections will have to be made (1 Corinthians 16:2). Remember this: Whoever sows sparingly will also reap sparingly, and whoever sows generously will also reap generously. Each man should give what he has decided in his heart to give, not reluctantly or under compulsion, for God loves a cheerful giver (2 Corinthians 9:6-7). Be sure to place your giving right at the top of your monthly budget/cash flow plan. In Financial Peace University, Dave Ramsey talks about making giving a priority by automatically taking out 10% of your monthly income right at the beginning of your budget. When we don't take this approach, all of our other life expenses have a tendency to crowd out our giving, and then we have a tendency to serve God the leftovers of our budget money instead of the "firstfruits," or the first and very best of what God has blessed us with. Determine the intervals in which you will give back to God through your local church. If you get paid once a month, then perhaps you should give once a month. If you are paid bi-weekly, then the Sundays closest to the 1st and 15th of each month may be your best choices to give. For many years, I did bi-weekly giving and then about a year ago, I decided in my heart to give every week for a couple of different reasons. First, I wanted to be able to give something each week instead of going every other week. Second, I wanted my church to have consistent cash flow from week to week. Utilize giving envelopes with cash or personal checks. Once you have established giving as a priority in your budget and you have determined the frequency of your giving, then you need to determine the method of your giving. 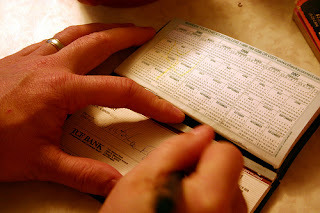 Are you going to withdraw cash from your bank account or will you write a personal check? Also, are you going to give anonymously, or are you going to utilize church giving envelopes so that the church can track your charitable giving for tax purposes? Whatever method you and your family decide to use, be sure to faithfully prepare your tithe and offerings on the weekends you have decided to give. The Saturday night prior to the Sunday you have decided to give may be a great time to prepare your gift. Before you go to bed, be sure you place your gift in an appropriate place so that you won't forget it before you leave for church on Sunday morning. Consider automating your giving. Many churches today have online giving tools in which you can setup an account where your tithe and offerings can automatically be deducted straight from your bank account. You can preset the amount of your gifts and place this on a set schedule, whether it be monthly, weekly, or somewhere in between. I'm a big fan of giving online because I never forget to give back to God through my local church what He has asked me to give. You can just "set it and forget it!" Once you have placed giving as a priority in your financial plan, you have determined your giving schedule, and you have selected your method of giving, then you must take action and follow through as an intentional giver. You will need to remember to take your offering with you and drop it into the offering plate on your predetermined Sundays. If you give online as a reoccurring automated gift, then you will need to monitor your bank account account activity to make sure that everything is working properly and according to schedule. Don't wait until you "feel" like giving, because you probably never will, at least to the level that you should. Come up with a giving amount and a giving plan, and then take action on your plan. God will bless you and your family as a result of your intention and faithful action. Now he who supplies seed to the sower and bread for food will also supply and increase your store of seed and will enlarge the harvest of your righteousness. You will be made rich in every way so that you can be generous on every occasion, and through us your generosity will result in thanksgiving to God (2 Corinthians 9:10-11).